Eating out in Havana used to be something of a struggle, a choice between a dozen private restaurants (paladares) which managed to obtain and keep a license and a few state run restaurants which occasionally would rise from mediocre to average. Today I probably still only regularly go to a dozen places but at least it is my choice! At their best these are cute owner managed businesses which have bags of personality, great food and attentive service. At their worst they are overpriced, pretentious with annoying service rubbish food and full of tourists disgorged from the latest tour bus – so be picky! Simply the best food in Havana bar none. This is Sergio’s place who most nights is to be found fussing around the kitchen, tinkering with new dishes and welcoming regulars with his own version of Italian Spanglish. While there probably is a menu I have never seen one, ask for the specialties of the day. The best starters are eternal including baked eggplant, shrimps, beef carpaccio and focaccia with jamon serrano. The home made pasta main courses are spectacular, try the tagliatelle al fungi porcini/gamberi and zucchine/alla marinara. This is not a fancy place, and is tucked away in a residential neighborhood; but is typically packed with a regular expat crowd. They manage to avoid the large tour buses. This is somewhere where no one comes in a hurry, the service is attentive but not in your face. Splendido! Bella Ciao lies a little off the beaten tourist track and doesn’t look that special from the outside. It is not so much a well-kept secret as inhabiting its own ecosystem which once you have acclimatized to, you find yourself to keep going back, for lunch with business colleagues for a quick bite, with the kids for an early evening pizza and for a booze up with a group of friends late at night. This is somewhere where you are made to feel at home – where the service is so attentive and friendly you want to send your partner for finishing classes there! The food is great without being spectacular – reliable quality. Steak, fish, pastas and pizzas, all served as large portions. O’Reilly 304 opened a couple of years ago and soon established a firm reputation as the best place to go while in Old Havana, indeed one of the best locations in the city as a whole with the best cocktails and service to die for. Always a little small for me however imaginatively the space was used I was delighted when the owners opened up a new place opposite, literally El Enfrente. Situated on multiple levels in part of a larger building space there is as long as you can book a table since this is now probably the trendiest restaurant in Havana attracting a clientele of tourists and expats. The food is good, think tacos, seafood, cerviche (again) and an excellent fillet. On the drinks front if they have a passionate fruit daiquiri take it and another. El Cocinero opened in February 2013 and soon become a smash hit, now, situated next to the FAC it has become a staple on the good food gravy train. Located underneath the imposing brick chimney of the same name (which used to be a vegetable oil factory). The second floor, designed for more formal dining, is in black and grey tones, with minimalist paintings hanging and a nouvelle cuisine approach to food. Outside, an open patio surrounded by lush plants has a distinctly bistro vibe. Personally I like the third floor terrace which is where the real buzz is although bear in mind you need to go up another couple of floors of spiral staircases. The rooftop terrace is used for dining and drinks. The décor is more modern, casual and pop. Its menu has been expanding under Chef Ramon Manuel Lopez Alarcon, who aims to provide inspiring, organic and fresh food. Tuna tatar and tuna tataki are his signature dishes. Maybe the food could be better and I get never get comfortable in the chairs but the service is so good, the atmosphere so cool without being pretentious that these are forgivable sins! Open on July 14, 1996 La Guarida (also known as Fresa y Chocolate after the film), has been in expansion mode. But before we get to that – the basics. This is the best known restaurant in Havana, this is where Madonna recently held her 50th Birthday party. It is the must go to place when the glitterati come to town from the Queen of Spain to the Queen of American pop (Beyonce). The building, originally known as La Mansión Camagüey, is both showing its age and its former grandeur. Some structural issues to the building have seen a major repair job undertaken on the original dining area and guests sent through the belly of the building to the back staircase. This being Cuba there is little cause for concern – just go with the flow. Given this disruption and a simply massive demand from tourists as the fame has grown the solution has been for more parts of the building to be taken over, more dining areas to be opened up. The result is a megaplex which still manages (just) to retain its charm and authenticity while being incredibly efficient and professional. Personally I like the outdoor terrace on the third floor and I love the top floor bar. Inside a little less these days but it is all good. The food remains consistent and it is reliable. How good, I blow hot and cold. Although the kitchen has been refreshed over the years with international experience, [currently the head chefs are Manuel Cio & Pedro Rodriguez] there is a practical reality to serving two sittings every night from a very small kitchen. Things have to be prepped, dishes have to be standardised, and the show must go on. Try the seviche, gazpacho or their signature appetizer of eggplant caviar. Caimanero (fresh grouper) might come in a white-wine, orange, or sweet-and-sour sauce–all are good, as is the honey-mustard chicken and pork medallions in mango sauce. The new menu has introduced many new dishes including an eggplant tart with parmesan cheese, seafood lasagna, watermelon with grilled shrimps and chicken curry amongst others, which have refreshed what had become a little predictable fare. Starbien serves some of the best food in Havana. For starters try the ceviche, deep fried cheese and my absolute favorite the tuna teriyaki. For mains the roasted snapper in lime juice and ropa vieja (slowly cooked shredded beef), is superb. Desserts were unavoidable once we had seen the neighbors’ chocolate torte (with dried fruit). The attractive multi-story 1930s house, with original tile floors and walls, is cool Habana in every sense of the phrase for its décor and style. Service is typically excellent with the young dynamic owner a steady presence. Indeed they are looking to expand to an adjacent place which gives an idea as to the popularity of this place where reservations are essential. My only gripe is with the indoor areas where the lighting and atmosphere is a little stale. The outdoor terrace is the place to be on the bottom floor. Santy has expanded. Having hidden away for so many years – a friend once begged me not to write a review lest his personal favourite be over-run. And then there was Anthony Bourdain in Parts Unknown eating sushi on CNN spilling the beans. What was once a clapboard single story wooden house now has a major upstairs terrace. The neighbourhood may be tough to find, located in Jaimanitas on the Western outskirts of Havana just shy of Marina Hemingway, but the odd tour buses may give away the exact location once you get close. The atmosphere upstairs has changed, it is less intimate, less exclusive. Not worse, just different. Personally I like the new vibe. Less preening diplomats and more “normal” Cubans enjoying the food. And if you like seafood, this is the place. Absolutely the best fish restaurant in Havana Starters include fresh sashimi, home-made smoked fish and a tuna tataki. Look for the baby lobster if they have it and ask for the whatever fish has been caught that day for a main course. Amazingly for a city by the sea Havana has precious few places to eat with a view to the deep blue ocean. Río Mar has a whole terrace overlooking the spot where the Río Almendares flows into the sea, opposite the historic 1830 Club (watch out for nights where reggaeton blasts across the bay!). This little bay is sheltered but gives you a sense and smell of the ocean without the waves. In the past year Rio Mar has expanded its outdoor terrace and even in the sweltering summer this is the place to be. Service is excellent and this is a well-run and swish establishment. Almost too much at times, it can be too pretty and not gritty enough for some with upscale prices. The food is excellent, baby Chateaubriand, lobster cocktail, spicy pork, garlic grilled fish—the menu is short but good. Drinks are reasonably priced, cocktails nicely made and the wine selection limited but with some good options. Booking is imperative at this diminutive paladar in a cobblestoned alleyway off Plaza Cathedral, one of Havana’s most iconic colonial squares. Over the past year other places have opened next door giving this whole alleyway a cosy and happening feel. We still prefer the original – so keep walking to the final place on the back right. Doña Eutimia feels like it’s been here forever; its walls are crowded with decorative antique clocks, paintings and local artwork and its rooms are divided by a splendid stained-glass window. The food is classic creole chicken, pork and fish, cooked well, and there are decent fresh juices (pineapple, guava, orange and papaya). The fried malanga (a Cuban root vegetable) appetiser is not to be missed. This bar-café-restaurant maybe a bit tricky to find the first time – bear in mind it is just behind Havana’s Capitolio. Run by a Frenchman this has a European style despite all the Cuban memorabilia. Open doors, high ceilings, a certain French attitude – don’t expect sycophantic service here! Disappointingly the food is only average – opening tapas are good, basque chicken ok and ratatouille a little better. 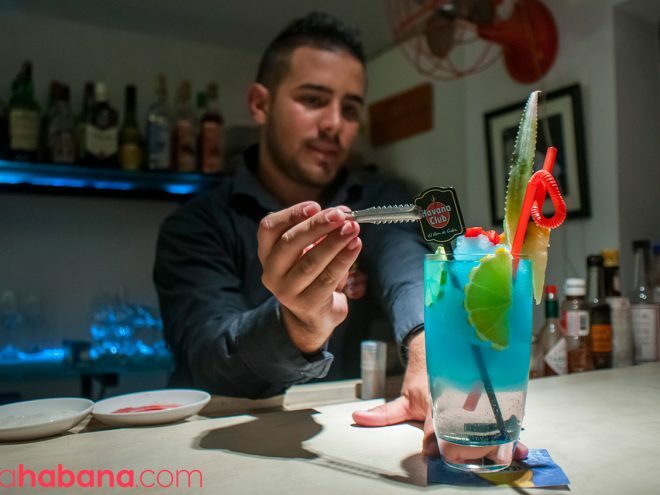 You come here for the vibe – on a normal night expect it to be packed to overflowing with Cuban hipsters, expats and tourists clutching recommendations. This is a lived in vibe, it is a here in this moment in time vibe, Havana in its teenage years of the 21st Century. Superb music where from the DJ or impromptu signing around the piano brilliantly played by the owner this is a place to enjoy. For the ultimate in Soviet retro we bring you Navdrovie, from the usher, dressed in a Russian sailor suit, greeting guests at the front entrance, to its vintage Soviet propaganda posters hung all over the walls, to a Valdimir Lenin bust flanked by tall vodka bottles, and all the way to the matryoshka dolls sitting on the shelves, Nazdarovie takes USSR nostalgia to a whole new level. Since its opening in 2014 this place has established itself as a home from home for Russian tour groups, the Russian Embassy, foodies and tourists. It has appeared in countless articles in the international press and has features in various food shows on Havana. It is consistently near the top of Trip Advisor’s rankings. Apart from the Soviet nostalgia guests on the outdoor tables have an outstanding view of the Malecón – catch cocktails there at sunset. Food wise, there is an eclectic mix from the old Soviet republics, not just Russia – think Georgia and the Baltics. Classic caviar sits alongside salade olivier and homemade Russian style raviolis filled with ground beef in sour cream to pan seared spicy chicken. Each dish is well thought out and presented with exquisite garnish.